New bloggers looking to make money online are told one thing over and over: expand outside of Google Adsense. I know you’ve all heard it before. “Don’t pull all your eggs in one basket” or “Increase your income stream two or three times.” While this all sounds good and dandy, nobody really tell you HOW to go about doing so, but rather that you should do it. If you’re new to making money online, this will be extremely challenging if you aren’t pointed in the right direction. Use the following tips to help move away from Google. And by research, I don’t mean read reviews on affiliate programs, but rather you need to research your own material. Find out what is the main driving force behind people visiting your blog. Check your stat programs (you do have visitor statistic software, don’t you?) to find where visitors are coming from, what keywords they use, and what are your most popular pages. This is the most important step you can take in expanding your income interests. After you do your research, you will know exactly what your readers are expecting to find when they visit your page. Now, you have to help fill their expectations. There are plenty of affiliate programs out there. The following list is some guidance to get you started. Commission Junction – Odds are, if you’re looking to become an affiliate for any major retail store, you’ll find it at Commission Junction. Apple, Newegg, Dell, HP, Best Buy, eBay, Yahoo, Monster, Staples, AT&T, GameStop, and Old Navy are just a few examples of the stores you can work with as a publisher. There are thousands of other advertisers with more and more added each day. Azoogle Ads – Azoogle is a bit tricky. They can’t compete with Commission Junction in terms of advertisers, but their interface and customer service can’t be beat. There is a wide-variety of advertisers to work with that may fill your specific niche. It’s definitely a program worth checking out. Amazon Associates – I’m going to go out on a limb here and assume everyone already knows about Amazon. With their Associates program, you can get paid a percentage per sale you make. The percentage you make per transaction increases with the number of sales you make. TTZ Media Affiliates – Recently launched, this affiliate program will search your content for relevant keywords and will display the best technology deals possible given the keywords they find. Clickbank Marketplace – I find Clickbank’s Marketplace to be the ‘Gray Market’ of affiliate programs. A lot of their advertisers consist of new ebook authors trying to make a quick buck. That’s not to say there aren’t a lot of useful programs, because there are. Just be careful in what you choose to promote. Now that you have a program to work with and an idea on what your readers are looking for, it’s time to get a little more specific. The most important thing to do is to stay relevant. Keep your ads interesting to your reader. Sure the $100 per lead webhosting product sounds like an amazing deal, but what’s the point of offering webhosting to 50-year-old women wanting to read about menopause? You’d sell them books on the topic with relevant information to their interests. Don’t be blinded by huge earning potentials. Stick with what you know your readers are looking for and you’ll be very successful. Affiliate marketing really isn’t rocket science. Anyone with a website, statistics on the readers, and the right program can make money online. Integrate ads into posts and your layout. Have you seen the following image? 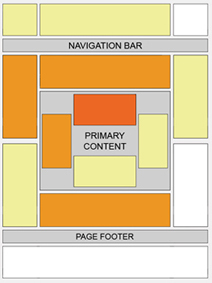 It’s Google’s heatmap on how well ads perform within a layout and within your content. If you have trouble reading graphs, the redder the area, the better the ad will perform. If you have Google ads in the following areas, and they are receiving a lot of clicks, try a little experiment with an affiliate product and see if the change pays off. Note what the ad is earning you now, make the change for about a week, and compare the differences. You might sacrifice a few dollars from Adsense, but you could end up with a much larger return. When I first started promoting affiliate programs, I felt my readers would find me dishonest and that I was just trying to make a quick buck. I can safely say now, this was never the case. There is no harm in making a post about the latest program you’re promoting. You’ll drive traffic, increase sales, and keep your visitors wanting more. This works exceptionally well if you can offer a personal and positive review.